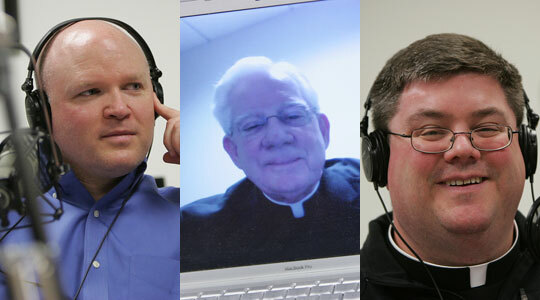 Summary of today’s show: On December 5, Cardinal Seán and members of the Archdiocesan Pastoral Planning Commission opened up a consultation process with almost 400 priests of the Archdiocese of Boston, discussing how best to organize the parishes in the archdiocese for evangelization and mission-effectiveness in the years to come. Scot Landry and Fr. Chris O’Connor welcome Msgr. William Fay, co-chair of the commission, to discuss the convocation and the proposal presented to the priests, which includes grouping parishes and assigning Pastoral Service Teams to them. Later, Scot and Fr. Chris listen to and comment on Cardinal Seán’s remarks at the convocation, including his five mission initiatives and four points he wished to make to priests about the proposal. 1st segment: Scot said today we would review yesterday’s convocation with priests, led by Cardinal Seán, Msgr. William Fay, and Fr. Jack Ahern, to give an idea of the direction the Archdiocese might head in the coming years. Scot welcomed Msgr. Fay back to the show. Scot said a lot has been written in the media in anticipation of the meeting. Msgr. Fay said pastoral planning is about reinvigorating ourselves for evangelization in the archdiocese. Attendance in the sacramental life of the Church is under 16%, which isn’t good for us or those who are not attending. Parishes are struggling for resources and we need to give them a boost. Evangelization takes place in the parishes and we need to energize the staffs by bringing economies of scale to eliminate redundancies. The key idea is Pastoral Service Teams, which would have one pastor for two or more parishes. He’d have a parochial vicar or two, a deacon, pastoral associates, catechists and more. They would look at what it means to do this outreach. These teams would sit down with the members of the parish pastoral council and finance council to develop a plan for the good life in communion for the parish. Scot said this is just the beginning of a consultation, not the presentation of what we’re going to do. It’s the result of months of effort of the pastoral planning commission. He said there’s been misreporting that this is just a new way to close parishes, but it’s not. Over the past two decades about 160 parishes have closed in the archdiocese and we don’t want to close any more going forward. Scot asked how the life of the parishioner would change as a result of this initiative. Msgr. Fay said hopefully they become more engaged and involved in their parish and become excited about their faith. The Church begins in the life of the family and for the Eucharist they come together in the life of the parish. Once we get people to to see what the life of faith is about, we hope they will make a commitment to bring other people into that life with Christ. So they shouldn’t expect much external change in the parish, but they will find some change within themselves and working more collaboratively with each other and nearby parishes. Fr. Chris asked how this plan is different from mergers or closures. Msgr. Fay said when you close a parish, the life of the parish comes to an end and it’s a kind of death. The plan is not to close parishes, but to bring them together in greater relationship with each other by having a pastor assigned to two or three parishes. He becomes responsible for the spiritual life of the parishes and their material existence as well. He is not assigned to a collaborative but to parishes and the parishes are bonded through the pastor in a new relationship. It is hoped that the parishes will then grow to have just one pastoral council, one finance council, and other aspects of unity. He said we’ve been wanting to turn around this downward turn for 20 years by closing parishes. Once we realize that the lack of resources is a lack of evangelization then the whole thing turns and we focus on the 84% who are not living their faith actively. Scot said a lot of our parishes don’t have anyone charged with helping form adults in the faith or young adults of youth. While many parishes have directors of religious education, if you bring the resources of two or three parishes together then there is more of a full complement of resources to assist the pastor to do all we are called to do as a church. Msgr. Fay said over the past couple of years he’s been trying to start an evangelization commission going on his parish council but he’s had no response. But when changed it from evangelization to outreach, people suddenly got involved and came up with all kinds of good ideas. Fr. Chris said there is talk of 125 teams. Why that number? Msgr. Fay said this is a work that has been going on for more than 1 year. We already have collaboratives in the Archdiocese, which are subsets of regions and vicariates. The commission took the work that had been done grouping parishes and looked at them in terms of certain criteria and finding what would be logical in terms of groupings. It became obvious that it would be closer to 125 than 75 or 225. Scot said people fear change and especially fear that it is too top-down, too centralized, that it won’t take into account the particulars of Catholic communities affected. He said that’s not the case here. There is emphasis on a local pastoral plan developed by the parishes themselves. Msgr. Fay said the purpose of the archdiocesan effort is to get parishes and collaboratives to start doing more pastoral planning. The Pastoral Service Team will be responsible for making this work, for strengthening the celebration of the Eucharist, the preaching, the music; educating people in faith formation, children, young adults, adults; outreach to neighboring parishes and those within the collaborative. That local plan will also look at the resources of the particular parish, its assets and how best to use them for evangelization. All these plans will be given to the Cardinal for approval and then become the mission plan for the archdioceses. Scot said one-size does not fit all and there will be great diversity in how to carry out the pastoral priorities the Cardinal has outlined. There are five initiatives and the purpose and end is to pay attention what they are doing at the local level and modify appropriately. Fr. Chris said yesterday’s meeting was also historical because the priests used a special remote control to vote on matters as the day progressed. Msgr. Fay said he has received positive feedback, including 25-40 emails from priests around the archdiocese who are heartened by what happened. He said 392 priests were registered for the meeting. It was clear that the priests liked the voting. He said by the end of the meeting the priests were very interested in using the devices. Scot said the types of questions asked of the priests included how willing they might be to pastor a PST or whether they thought the pastoral team model took us in the right direction. The answers allowed Cardinal Seán and the commission to understand whether the priests believed they were on the right track and the immediate feedback was that they do think so. Msgr. Fay said he hoped everyone realized that this is the first part of proposal and consultation and through the spring everyone in the archdiocese will be able to give their opinion. He said the priests answered the question on whether this was the right direction with a yes by an overwhelming two-thirds or more. Fr. Chris said Msgr. Fay articulated clearly that there is a plan before us that needs some language in it so we have something to talk about and wrestle with. Msgr. Fay said that while this proposal is very clear, it’s not a done deal. They made it so that there could be a fruitful conversation. Scot asked why it was important for the commission to hear from the priests first and what other types of consultation will take place. The cardinal had to go to the priests first because of the sacramental bond with them. They extend his ministry throughout the archdiocese. Msgr. Fay said the deacons also share in that apostolic ministry, but they will also reach out to pastoral associates, catechists and the laity throughout the archdiocese. They’re looking to do this in the second half of January, February and March. Scot described the website that has been prepared with the documents from yesterday as well as videos of three talks, by Cardinal Seán, Msgr. Fay, and Fr. Jack Ahern. Msgr. Fay said the intent is to have a fully transparent process and we all have a stake in it. Every baptized person shares in the mission of the Church. It’s important for them to see what is being proposed and look at it from their perspective and advise the archbishop in how to move forward. What we need are people who want to build the Church, not just to be critical of it. Msgr. Fay said this is a very exciting and grace-filled time of opportunity. We’ve lived through challenging times, not just in the past decade, but throughout the history of the Church. He thinks the attitude, talent, and energy of the people bode well for the future of the Church in Boston. 2nd segment: Scot said there were three addresses yesterday. The Cardinal gave about a 30-minute address in which he framed the entire discussion. 12/05/2011 Strengthening Parishes – Cardinal Seán O’Malley from Archdiocese of Boston on Vimeo. Our evangelization efforts in the Archdiocese of Boston will be rooted in and accomplished through five “mission initiatives” to which I commit the Archdiocese and myself today. The first initiative is becoming a Church that more readily and actively welcomes every man, woman and child to conversion of life in Christ Jesus. Everyone is welcome in the Church, because the Lord offers his gift of salvation to all. Let us each accept and help others to accept the radical and transformative call to conversion of life that is offered to us by Jesus Christ. The second mission initiative is strengthening our parishes as primary communities of faith, communities that have the worthy celebration of the Eucharist as the “source and summit” of parochial life. The third mission initiative is growing the Church through this work of evangelization. Currently less than 20% of our baptized Catholics are attending Mass each Sunday. We need to change this in a dramatic way and we need to begin doing it now. The fourth mission initiative is developing excellence in faith formation for Catholics of all ages. Our people thirst for greater catechesis in the faith. We need to marshal, strengthen and make more available the great resources we have to satisfy that thirst. The fifth mission initiative is re-energizing pastoral leadership. I am deeply aware of how challenging these past ten years have been for you, my brother priests, and how thin you have been stretched. I hope that our work together today indicates clearly to you that I am very much aware of the burden that you carry, committed to discovering ways to lessen the load, and very desirous of supporting and strengthening your love of the priesthood. Scot said we haven’t talked enough about how the Cardinal agreed with his closest advisors on five mission initiatives and received feedback from across the archdiocese on them. The first is becoming a Church that more readily and actively welcomes every man, woman and child to conversion of life in Christ Jesus. Conversion is so important and we are all called to ongoing conversion to grow in holiness. Fr. Chris said if we’re going to welcome others and bring them to the faith, then we have to live lives marked by holiness. It requires conversion of person in the Church in order to go out and reach others. There’s nothing more beautiful than the Catholic faith when it’s lived to its fullest. Scot said secondly everyone is welcome in the Church. Cardinal Seán says the Church is hospital for sinners, not a museum for saints. There’s nobody in the Church that doesn’t need to convert themselves. Fr. Chris said we are sinners on the road to holiness. The second mission initiative is strengthening parishes as primary communities of faith. Scot said because we experience our faith the most in parishes, then parishes need the resources to help us grow in our faith. So many parishes don’t have the resources for adult faith formation and many of us didn’t learn our faith as well should have in the 70s, 80s, and 90s. That’s one of the ways to grow to meet objective number 1. Fr. Chris said there’s more we can do even with our young in religious education, we need to inspire others to find the one thing worth dying for in our faith. We need to articular for ourselves what we believe so people will respond to it. Scot said a good habit to begin with is to read one or two pages of the Catechism every night. The third initiative is growing the Church through evangelization. To often we have looked inward and not looked outward. All of us coming to Church needs to better identify those we know who are missing out on the sacramental life and invite them to share in what we have. We are all called to be fishers of men, not keepers of an aquarium. We can’t be content with just those in the pews; we have to be out actively looking. The fourth is developing excellence in faith formation for all ages. There is a general sense our parishes do youth formation well, but not so much for teens or young adults or adults. He wants every parish to have those programs. The fifth is re-energizing pastoral leadership by restructuring how people work with one another. Fr. Chris said if the plan goes through, we will see fewer pastors and more parochial vicars. Fr. Jack Ahern emphasized the beautiful gift of priests living together in community, supporting each other. With one pastor and a team serving three parishes, you will see best practices become shared practices. Without getting into the detail of the proposal, I want to say four things about it and your ministry as parish priests. First, the proposal does not present a plan for the global closure or merging of parishes. This is not 2004. I am very happy about that. The closing of a parish, however necessary, always involves heartbreak. In the proposal before us, any discussion about the closure or merging of parishes will be initiated at the local level, in the pastoral collaborative. Moreover, by stepping away from closure and merging, the proposal puts the brakes on the large-scale downsizing of the Archdiocese that we have been engaged in since the early nineties – and well it should. A Church that is committed to a New Evangelization and to re-energizing its clergy, lay faithful and parishes is looking at life and not death, growth and not decline. Second, the success of this proposal turns on the success of the PST, the Parish Service Team. While every PST will have a pastor who is ultimately responsible for the spiritual and material good of a pastoral collaborative, the success of the ministry that takes place within a collaborative will be effected and measured by the respectful and enthusiastic collaboration of every member of the PST. I encourage you as clergy to call forth the religious and the lay faithful of the Archdiocese to the highest level of collaboration in your ministry that the Church recommends. Third, with the possible introduction of approximately 125 pastoral collaboratives in this proposal, we face a new reality. Priests who have been living alone in a single-parish ministry would have the opportunity to live together. I want to encourage that. I say this not because I am a religious and consider community life normative. I say it, because my twenty-seven years as a diocesan bishop has taught me that the life of the parish priest can be a very lonely thing. You know that better than I do. By sacred ordination, you belong to “an intimate sacramental brotherhood” (PO 8). I exhort you to use the new opportunities provided by this proposal to choose ways to strengthen and reinvigorate the holy brotherhood that is yours in Christ. Fourth, the biggest question I have heard raised about this proposal is: “There’s a lot involved in this. What kind of support can we expect from the Archbishop and the Pastoral Center?” I want to go on record today as saying to you that I and the staff of the Archdiocese will do whatever it takes to make this work. No doubt, there will be anticipated and unanticipated challenges. We will meet them, one by one, as they arise and try to do this in an organic way, taking the time needed to do this well. Implementation must be slow, deliberate and mission driven. Scot said it was great to hear the Cardinal summarize what he has received from the planning commission in four points. First, it doesn’t present a plan for global closing of parishes. Some have agendas that want to say this is about closing parishes. However, local planning might result in the people deciding themselves to close unneeded buildings or worship sites. But it won’t be done centrally. Fr. Chris said the Msgr. Fay referenced that this isn’t a merger or closure, because if a greater number priests are ordained and people come back, then we will need those churches. It’s a practical plan bringing people to work together for the good of the Church in that area. People will energize their community and bring the Church alive there. Scot said the second point is that we need to take collaboration to the next level. We need to get out act together to provide all the ministries we need. The third is that he wants priests to live with brother priests, that too many live alone. It’s helpful to priests to have others to share life with, to talk to each day, to share struggles joys and victories and defeats, to share a meal together, to pray with. These are crucial to good holy and healthy priestly life. The fourth point is that the Cardinal knows that the planning process will put a lot of work on parishes and that the Pastoral Center staff will go through a lot of work to reorganize themselves to best complement what is happening on the local level. Fr. Chris said the cardinal was clear that he will stand behind the plan when it is implemented. All of these key addresses and documents are available at 2012planning.org.